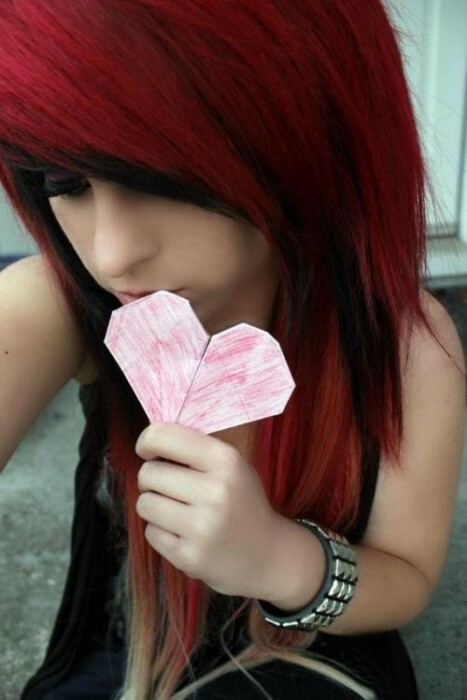 Many associate the EMO trend with melancholy and loneliness. However, today’s contemporary teens have given a whole new meaning to the tendency. They’ve made it cool, innovative and quite memorable. 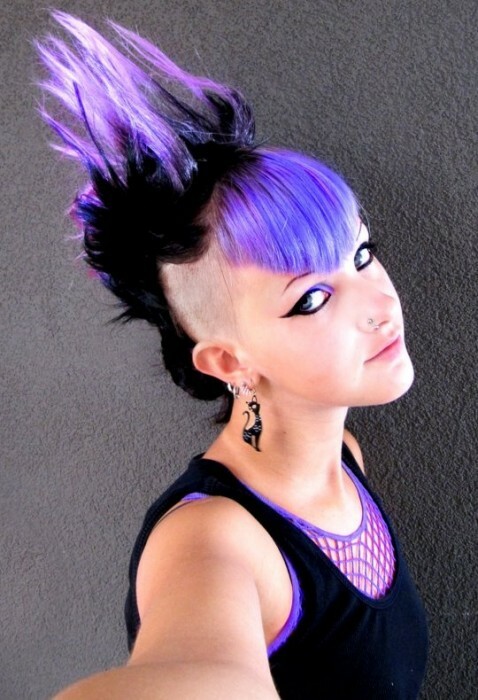 EMO hairstyles are one-of-a-kind; they’re unique, creative and interesting. Here are 40 amazing hairdos for girls. Show your cheerful, funky nature by keeping your hair short and adding in a variety of colors. There is no limit to the number or choice of colors; just let your personality guide you! Just remember that this hairstyle will attract attention. Adding a few clips and bangles in similar colors will finish the look. Go for a real funky look and make a statement that you do not conform to preconceived notions of normality! By using pointed layers at the back of your head and cutting the front into a V shape, off centre you will create a hairstyle that retains your femininity without looking too girly. You can even add a little of your favorite color to finish the effect! This look is contemporary, smart, elegant and yet slightly scruffy. It is the idea hairstyle for those with straight hair who are looking to create the appearance of someone who cares about their appearance; but wants to do it their way. If you had a few straight bits of hair across your forehead you will perfect the look. This look is very feminine and can be used to make a lasting impression by adding a few streaks of color. Your hair needs to be cut into layers, but each of the layers is a different length. The longest, tip, of the layers is over each ear and a few wisps should be near or over the eye. This is another cut suitable for straight hair; with a professional shine. It creates a sassy look. 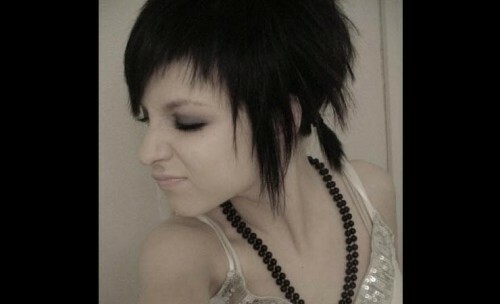 This classic hairstyle can be given an Emo style twist. Your hair will need to be cut into varying sized layers with enough at each side to create a pigtail. It creates a funky, rock chick type of look and allows you to tell the world that you are ready for anything. A smart, distinctive look can be created in just moments. Your hair will need to be cut short at the sides and left a little longer on top. Sweep the hair on top of your head into a big curling spike and secure with hairspray, wax or even styling gel. 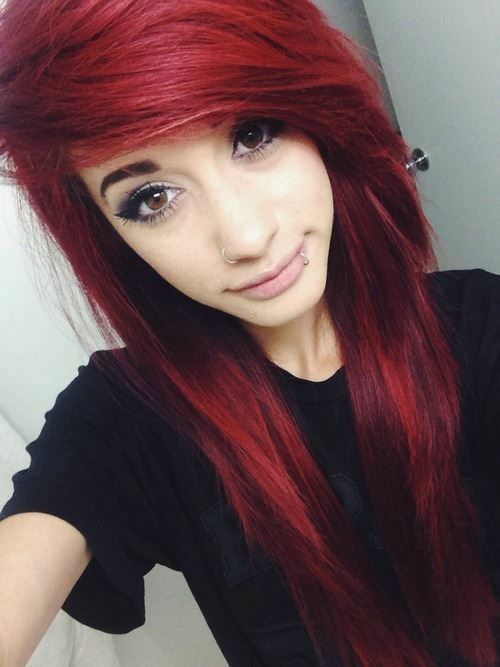 It is best to keep the hair one color but this can be any color of your choosing! 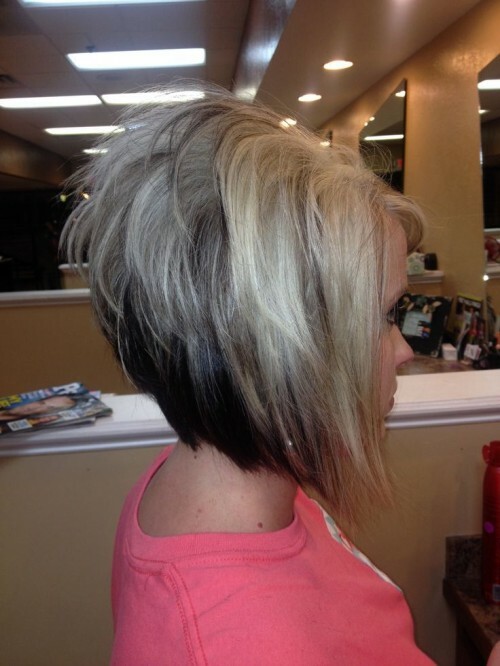 This is an angled bob, the same hairstyle that many women choose to wear. 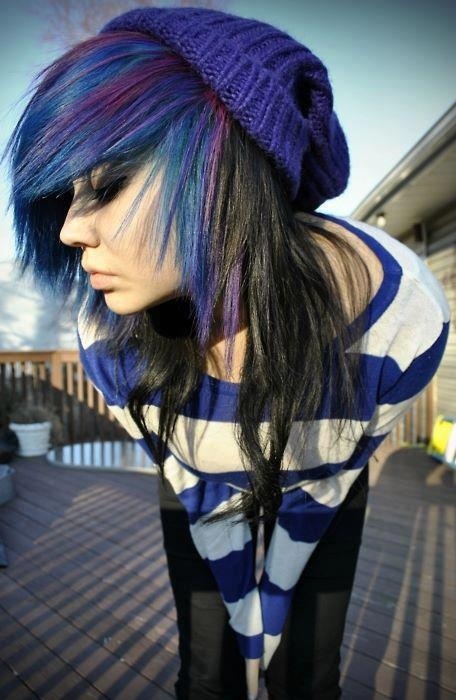 However, by adding a color, you can turn the conventional style into a cool Emo look. Slate blue is a popular choice although any pale color can be used to excellent effect. Matching your eye color can add a really cool touch to this style. Green is a distinctive color and not one that you wish to use lightly! Any hair style can be used although it works best with longer, wavier hair as this breaks the color up. Either color all your hair or just the top half, leaving the bottom part a dark color for maximum affect. This is best suited to short hair and is easily achieved by drying your hair with a blow dryer whilst back combing with a round brush. Gentle manipulating your hair will create volume and bounce to give a sophisticated, vampire type look. Hair spray or styling gel can be used to hold it in position. For the more feminine look add a few curls to a traditional layered haircut. Ideally your hair should frame your face and the curls should move softly away. Make the cut extra funky by adding two tone colors; light and dark blue are a particular favorite. Keep the hair on top relatively short with several layers to create some volume. Then add to this several long layers down the sides, angle these side layers towards the bottom of the face to create a feminine yet practical haircut. Just don’t try to add to much bounce to the look! Keep your hair short and use a little hair spray to ensure it has a ruffled look. 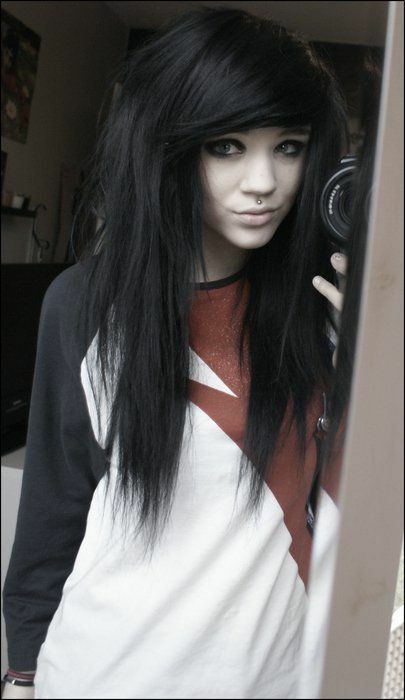 Several pieces of your hair should be allowed to stick out, although only a little; you don’t want spikes! Add some highlights into the crown and a little around the sides of the face for a glamorous, funky look. It works best if your hair is already black. Layer the sides of your hair and make sure they are pointed over the ears; ideally the ends of your hair should be thick and choppy, not too refined. 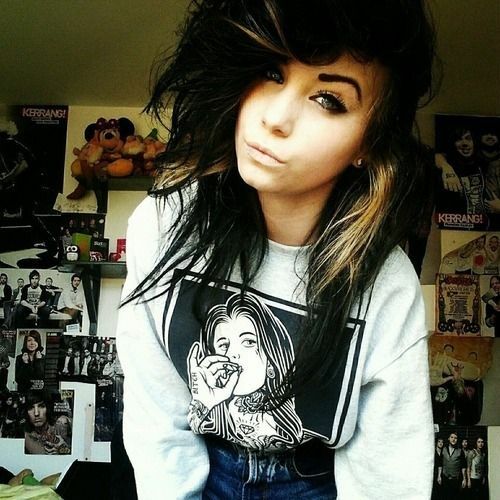 Your hair should frame your face and fill your forehead with just a little over one of your eyes. This is guaranteed to get some admiring glances. If you already have an Emo style cut then a headband can create a range of different styles to brighten any day! Place it far enough back to leave the hair over your forehead, it should push the rest of your hair up slightly and create a stylish, funky look. Sometimes the hairstyle can be best achieved by accessorizing what you have. 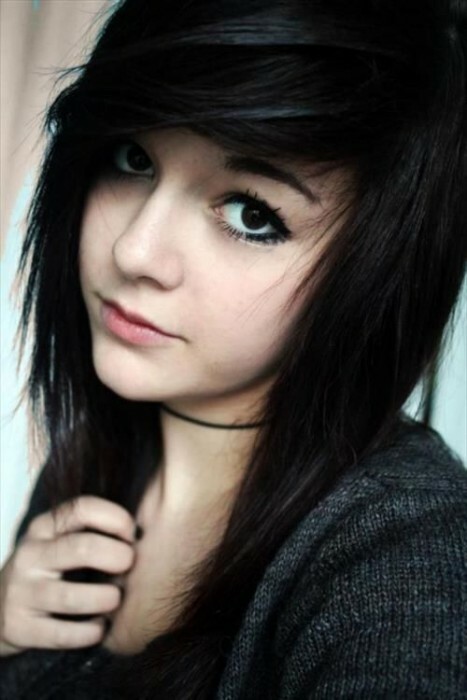 Using a simple, classic Emo cut add a bow or something similar in a color which matches your outfit. This is a simple way of adding to your existing style and creating a sharp, professional look. Have your hair cut with large long layers, keeping plenty at the sides to emphasize this look. Add an extra touch by back combing the ends and create a pointed hair style which expresses you inner emotional sensitivity whilst looking funky. Backcomb your hair whilst leaving the sides lean and flat. Add a little color to the style by putting streaks in; preferably in two different colors. The length of your hair doesn’t matter; you will create a fabulous looking hairstyle! 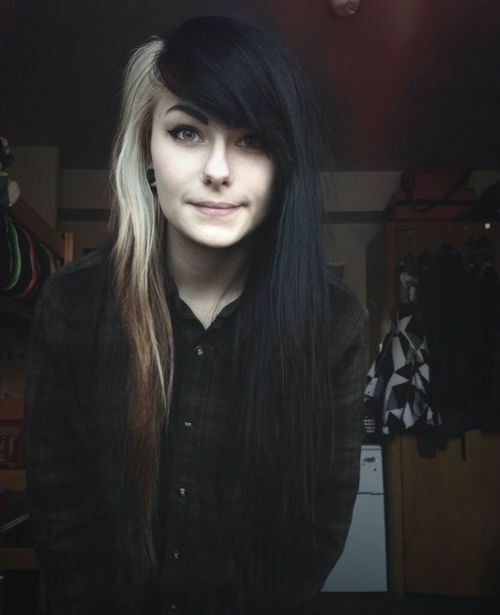 In sharp contrast to many of the Emo styles you could try dying your hair blond. Make sure the front of your hair features blunt ends and the sides have harp points which adhere to the lines of your neck. 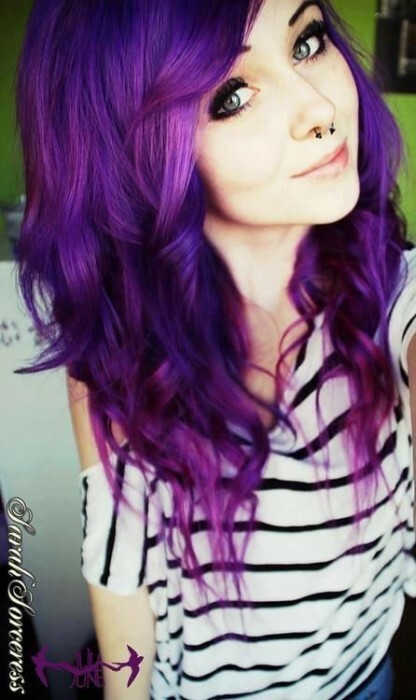 Add in a rinsed look with a light blue or purple and see a whole new you! Just because you are an Emo does not mean you cannot embrace modern fashion. Keep your hair long and sweep it to one side, allowing it to become a little messy. Finish the look by fishtailing the ends to give a trendy yet troubled look. 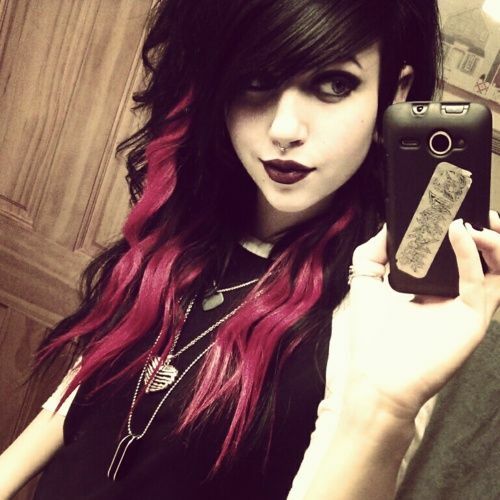 Add some serious color to your hair, try black and mauve. One color should fade into another whilst your hair should have a sharp edged cut. Keep the hair straight and swept off your face to create a stylish and funky look. 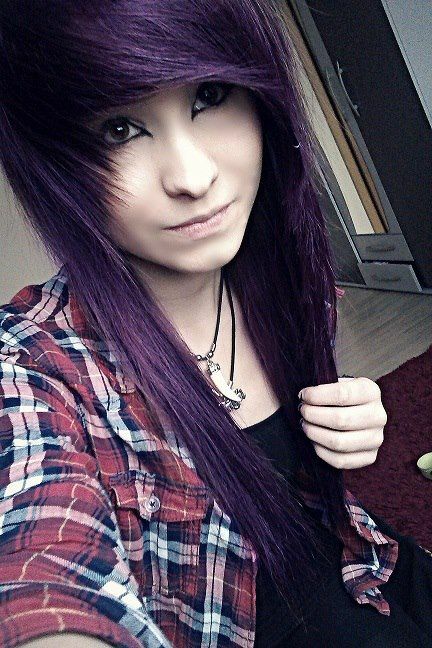 This is another style which drifts from the traditional Emo black. Color your hair blonde and make sure the cut emphasizes the angled look. Hair across your forehead should be swept to one side reaching a point whilst a side pony tail, which also finishes in a point, this will add the right effect. Finish the look by adding a few brown streaks; look stunning and unique! A classic Emo cut can, at times, need a little lifting and brightening. 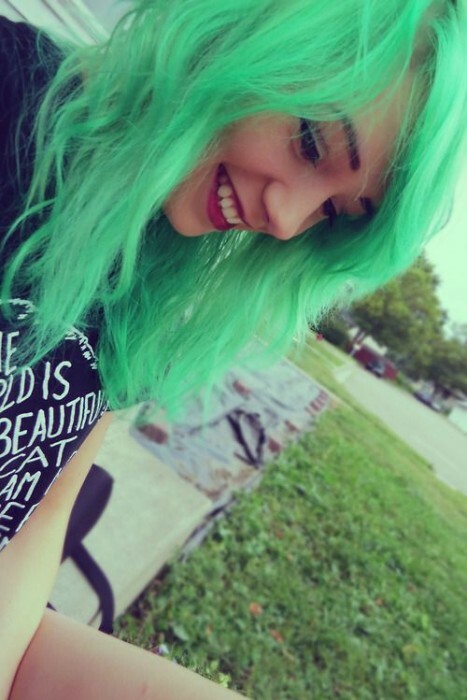 One of the best ways of doing this is to add alternate colors to the bottom half of your hair. 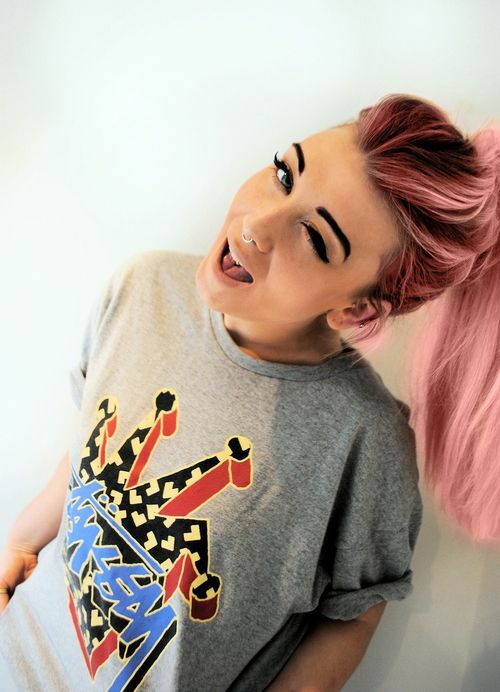 Pink or red run through the bottom half of your head will create a totally new look and can even be achieved at home! 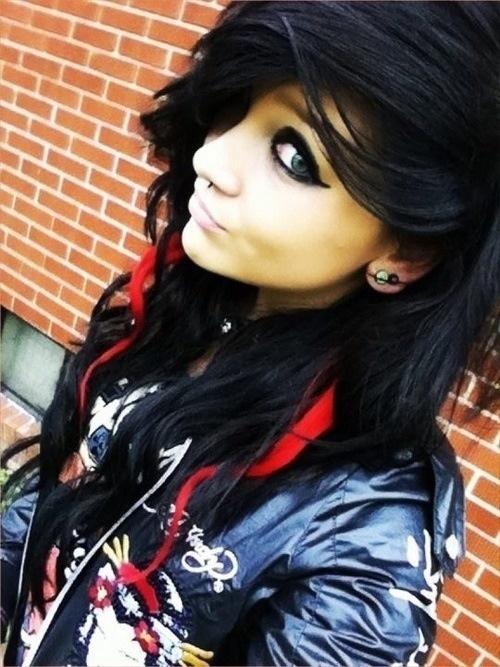 You may not want to look like a punk rocker but this classic look can easily be adapted for the Emo cause. One side of your hair will need uneven layers whilst the other is shaven. 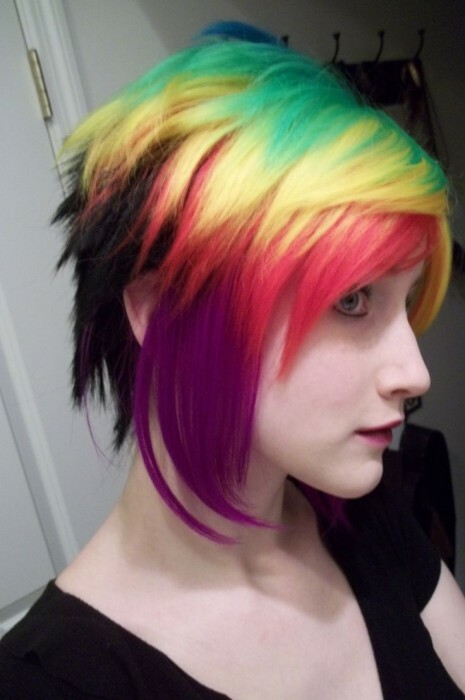 Ideally add plenty of streaks of color into your hair before randomly spiking it and securing with hair spray. Classic and fantastic! Add a whimsical look to your Emo style by having razor line layers put into your hair and allowing it to fall each side to a sharp point. Make sure some of your ends are a little wispy and your hair remains jet black. 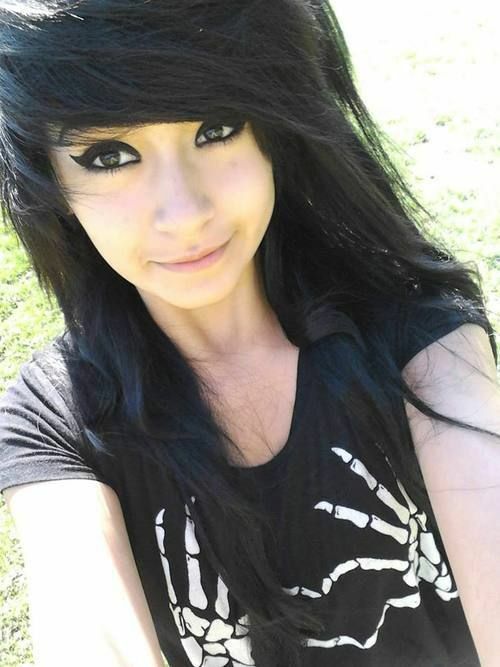 Model looks with an Emo style! Let everyone know who is really in charge, add a tiara to a tousled haircut and create a unique, memorable image. Make sure you hair remains layered with a little volume on top and long pointy sides. You’ll look like a queen with a sensitive soul! 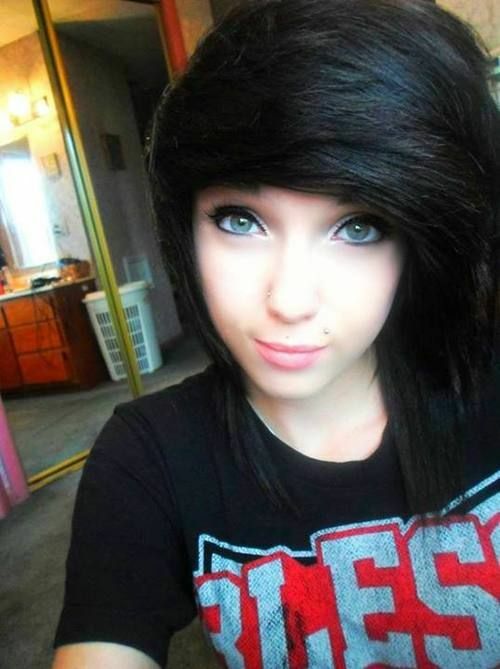 Emo’s can carry off the rock chick look better than an actual rock chick. The secret is in the razor line cut and staggered layers, creating a style that dominates on one side. This needs to be spiked across the top of your head and small spikes out of the side of your head. Add some streaks of a dark color to really finish the look. Frame your face with wavy long hair using the traditional Emo cut. Keep the layers and the razor line cut to ensure the hair is not too sleek; it needs to have a ruffled look. The curls add a touch of glamour and can be accentuated with a little lighter color at the tips of the hair. A free soul is comfortable and confident in any hairstyle. Keep it simple by allowing your layered hair to be swept to one side, not brushed. The different layers will create a side swept mess which can be complimented by a few strands of hair each side of the face; reaching a sharp point. 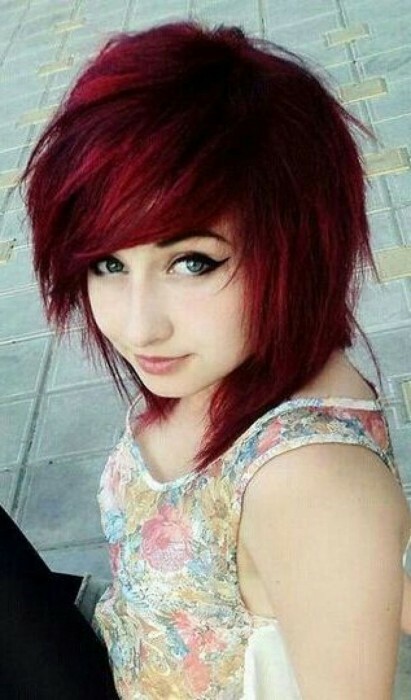 This style is good for those with slightly longer hair, but who want the short hair look of the Emo. The hair should be swept over the head to create a classic side swept mess. The longer hair at the back needs to be wrapped around the side of the neck, and shoulders if necessary. This will frame the neck and add a touch of glamour. Have your hair cut into uneven layers, with sudden changes in their depths. Add in a few colors to maximize the feeling of being different and then let it all fall. The top should be semi spiky and the sides will run into uneven edges, perhaps even a little wispy. This style shouts out that you don’t care what others thing; it takes a little confidence. Back comb almost any hairstyle slowly; use a brush and do it a little at a time. Hair spray is ideal to help it stay in position. You can create a huge variety of styles this way but heaping it on top, a little at a time will keep the classic Emo look whilst adding your own, funky stamp. 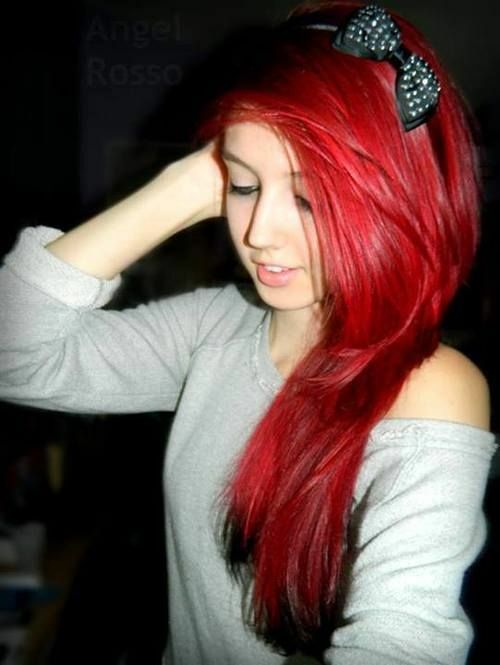 Red is not the usual color for an Emo hairstyle but it can be combined with blond locks to create a stunning statement. 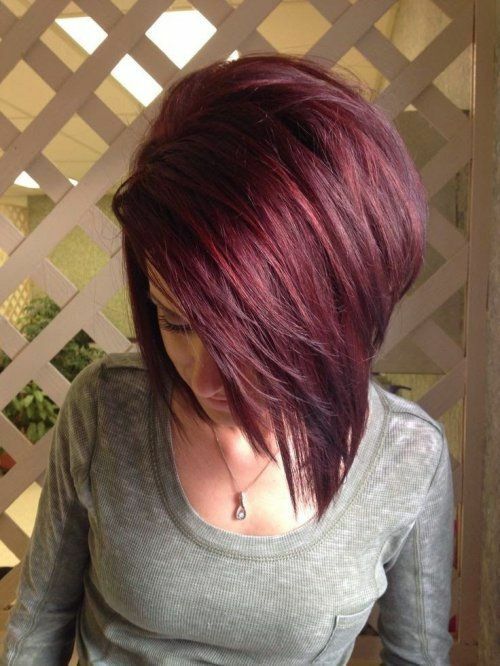 Using the traditional layers and adding the bright red to just the front part of the hair will create a fabulous look. Add a touch of sophistication to your standard Emo cut by adding in a variety of golden colors, honey, golden blonde or chocolate can all be streaked through your hair to create a quirky, sophisticated, Emo look. Add layers and texture to your razor line cut hair and then back comb it on top of your head. Allow the sides to fall as usual to create a lifting, textured affect. Streak a little brown through your black hair to finish the look. Create a layer of hair which finishes in a variety of different lengths and allow it to fall across one of your eyes. The remainder of your hair should be layered with an uneven cut and left to fall naturally down to your shoulders. The look is elegant and deadly! 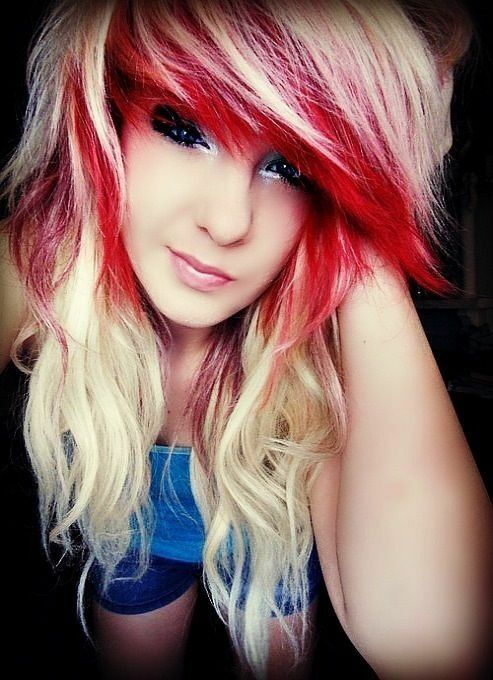 Your classic Emo cut can be enhanced with the addition of some bright colors around your face. Use several different shades but make sure they complement each other with the darkest shades merging into the rest of your head. Keep your hair around rather than over your face to create a perfect picture. In an unusual twist for an Emo cut you will need to have the majority of your hair cut to the same length, only the lower levels need to be layered. Sweep all your hair onto your head, creating an almost ball like look; then use hair spray to secure the spikes in your hair. A little color on the tips can add to the effect. Using a range of layers and razor line cuts you will be able to make your hair look as though the wind is blowing it out, on both sides at once! Add a streak of color to a longer piece of hair at the back and allow it to lie across the inside of your neck. Put the standard heavy mascara on and be amazed at how stunning you look! This is a very simple Emo cut. Again, your hair will need to be layered and then swept to one side. The sweep should be tidy and cut halfway across one eye. Ideally any excess hair on this side will curl around your neck. The other side of your hair should hang as straight as possible with a jagged finish. You’ll catch everyone’s eye! There you have it girls! 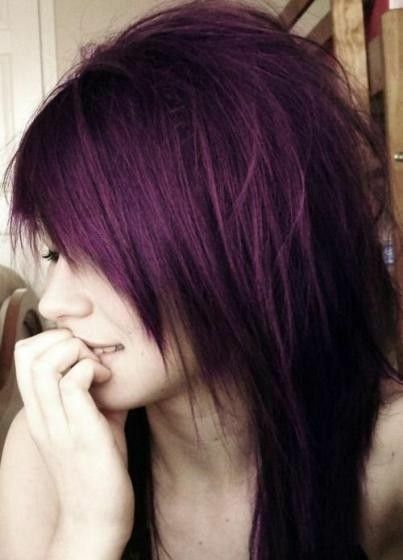 40 amazing EMO hairstyles to try out. Don’t they all look cool?